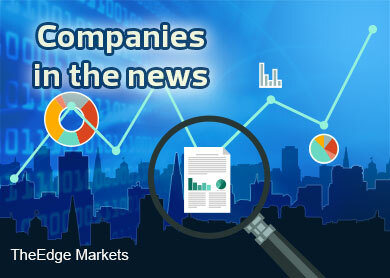 KUALA LUMPUR (Nov 28): Based on news flow and corporate announcements today, companies that may be in focus next Monday (Dec 1) could include: Malaysian Airline System Bhd, Instacom Group Bhd, Eduspec Holdings Bhd, Carlsberg Brewery Malaysia Bhd, RGB International Bhd, Wah Seong Corp Bhd, Mudajaya Group Bhd, Sentoria Group Bhd, Mulpha International Bhd and Datasonic Group Bhd. Malaysian Airline System Bhd (MAS) posted a net loss of RM576.1 million in the third quarter ended Sept 30, 2014 (3QFY14), the widest loss the ailing carrier has seen since the fourth quarter of 2011, which is 53.4% more than the RM375.44 million it recorded in the previous corresponding quarter. Revenue for the quarter was down 13.36% to RM3.38 billion from RM3.90 billion in the previous corresponding quarter, as revenue was hit by the twin catastrophes of MH370 and MH17. The national carrier was also loss making at the operational level. It posted a loss before interest, taxes, depreciation, and amortisation of RM161.54 million, compared with an earnings of RM62.25 million a year ago. For the nine months ended Sept 30, 2014 (9MFY14), MAS' net loss widened by almost 60% to RM1.33 billion from RM830.25 million in 9M13. Revenue stood at RM10.6 million, down 5.75% to RM10.57 billion from RM11.22 billion a year ago. MAS share price closed unchanged today at 26.5 sen, giving it a market capitalisation of RM4.43 billion. Telecommunications towers builder Instacom Group Bhd reported a net loss of RM2.02 million in its third quarter ended Sept 30, 2014 (3QFY14), from a net profit of RM7.82 million a year earlier. The group said the weaker result was due to lower margin contributed from its civil, mechanical and electrical works segment. It added that it remains obliged to service its fixed cost despite the reduction in revenue, which resulted in a situation where costs out-ran revenue. Revenue for the quarter more than halved to RM11.81 million, from RM36.44 million in 3QFY13. Moving forward, Instacom is banking on a 400 telecommunication towers tender that will be called by the Malaysian Communication and Multimedia Commission, which will amount to approximately RM300 million. "It is anticipated that the awards shall be made by early 2015, with construction expected to commence in early 2015," Instacom said. Instacom closed down 1 sen or 5.41% at 17.5 sen today, giving it a market capitalisation of RM122.89 million. Eduspec Holdings Bhd, an electronic learning provider, posted a more than five-fold rise in net profit to RM7.17 million in the fourth quarter ended Sept 30, 2014 (4QFY14) from RM1.33 million a year ago, driven by higher revenue. Its 4QFY14 revenue more than doubled to RM 29.06 million from RM11.75 million in the previous corresponding quarter, due to increased sales from its "sale of goods" segment, which rose almost threefold to RM22.59 million from RM5.79 million a year ago. Eduspec was today's Stock with Momentum in in theedgemarkets.com. For the full year, net profit was eight times higher at RM6.85 million from RM854 million a year ago, while revenue stood at RM58.42 million, up 71.4% from RM34.09 million in 4QFY13. Eduspec closed 1 sen or 3.51% higher at RM29.5 sen today, giving it a market capitalisation of RM225.82 million. Carlsberg Brewery Malaysia Bhd saw its net profit grow 46.4% to RM56.28 million in the third quarter ended Sept 30, 2014 (3QFY14), up from RM38.44 million a year ago, thanks to increased revenue, in particular from Singapore, improved price and product mix, as well as effective cost efficiency measures. In a statement to Bursa Malaysia this evening, the beer maker said its 3QFY14 revenue was 16.2% higher at RM409.32 million, compared to RM352.12 million a year before. The stronger revenue was attributed to a 3.8% revenue growth from its Malaysian operation and a 66.1% revenue growth from Singapore. For the nine months period (9MFY14), Carlsberg's net profit grew 24% to RM148.65 million from RM119.88 million a year earlier. Its revenue also increased 3.8% to RM1.211 billion, from RM1.167 billion last year. Carlsberg rose 24 sen or 2% to RM12 today, giving it a market capitalisation of RM3.692 billion. RGB International Bhd reported a significant jump of 564% in its net profit for the third quarter ended Sept 30, 2014 (3QFY14), to RM6.3 million, from RM946,000 in the preceding year's same quarter. Revenue for the quarter rose 51% to RM61.5 million from RM40.8 million. In its announcement to Bursa Malaysia, the company said its sales and marketing segment saw higher revenue and profit for the quarter, due to an increase in number of machines sold to new and existing casinos in the region. For the cumulative nine-month period (9MFY14), RGB's net profit tripled to RM15.5 million from RM5.2 million in the year before; while revenue jumped 50% to RM158.4 million, from RM105.9 million. RGB rose 0.5 sen or 3.45% to 15 sen, giving it a market capitalisation of RM170.6 million. Wah Seong Corp Bhd's net profit for the third quarter ended Sept 30, 2014 (3Q14), jumped six folds to RM30.31 million from RM4.28 million last year, driven by the better performance from its oil and gas segment and ots industrial trading and services segment. Quarterly revenue was RM592.46 million, 42.63% higher compared to RM415.37 million in 3Q13. For the nine months period (9MFY14), Wah Seong's net profit ballooned to RM91 million, a 677.78% increase from RM11.7 million last year. Cumulative revenue climbed to RM1.73 billion, up 35.16% from RM1.28 million last year. Wah Seong said its current order book amounted to RM1.4 billion comprising RM939.4 million for O&G segment, RM30.2 million for renewable energy and RM180.4 million for industrial trading and services. It closed down 3 sen or 1.86% at RM1.58, giving it a market capitalisation of RM1.22 billion. Mudajaya Group Bhd's net profit slumped 97% to RM1.07 million in its third quarter ended Sept 30, 2014 (3QFY14), from RM40.03 million a year earlier, dragged down by its construction segment. Revenue for the quarter fell to RM208.66 million, from RM391.46 million in 3Q13. "The financial performance of the group for 2014 is expected to be weak, due to deferment of some major local projects which the group is currently pursuing, as well as additional provision due to protracted discussion on disputes related to variation orders and claims, which are currently under negotiations," Mudajaya said. It recorded a lower net profit of RM29.48 million in the nine-month period, versus RM128.27 million a year earlier. Revenue fell to RM854.06 million, from RM1.2 billion. Mudajaya closed down 6 sen or 3.17% at RM1.83, giving it a market capitalisation of RM985.27 million. Sentoria Group Bhd saw its net profit plunge 71.3% to RM10.06 million for the fourth financial quarter ended Sept 30, 2014 (4QFY14) from RM35.01 million a year ago, mainly caused by its leisure and hospitality division which incurred much higher costs consequent to the opening of the Bukit Gambang Safari Park in Bukit Gambang Resort City in Kuantan, Pahang, at end-FY13. Revenue for 4QFY14, however, rose 8.2% to RM64.52 million from RM59.65 million a year ago, mainly due to higher billings from its property development division. The weak quarterly results dragged Sentoria's net profit for the 12 months ended Sept 30, 2014 (FY14) by 45.1% to RM29.14 million from RM53.09 million in FY13. Revenue for FY14, however, increased 5.3% to RM218.4 million from RM207.5 million in FY13, also mainly due to higher billings from property projects. Sentoria closed up 4.51% at RM1.39 today, bringing it a market capitalisation of RM577.74 million. Mulpha International Bhd's net profit for the third quarter ended Sept 30, 2014 (3QFY14) jumped over four-fold to RM44.05 million from RM8.67 million in the previous corresponding quarter, mainly due to higher contributions from its property and investment segments. Revenue for 3QFY14 also jumped 67.75% to RM296.8 million from RM176.93 million in 3QFY13, boosted by higher revenue from its Leisure Farm project in Iskandar Malaysia and a gain on disposal of its Raintrees Residences. Meanwhile, its cumulative nine-month financials showed a net profit of RM48.97 million compared to a net loss of RM74.23 million, while revenue was up 18.1% to RM601.53 million from RM509.4 million. Mulpha closed unchanged at RM0.405 today, giving it a market capitalisation of RM864.15 million. Datasonic Group Bhd posted a sharp 66% fall in its net profit for the second quarter ended Sept 30, 2014 (2QFY14) to RM9.39 million, against RM27.7 million achieved in the preceding quarter ended June 30. Revenue came in at RM53.49 million, 25% lower compared with RM71.5 million recorded in 1Q14. For the six months ended Sept 30, 2014 (6MFY14), its net profit stood at RM49.52 million, while revenue was RM176.88 million. Datasonic close down 9 sen or 7.44% at RM1.12, giving it a market capitalisation of RM1.51 billion.